Reflexology has a proven track record in offering effective relief from stress, fatigue and low energy levels. Try our invigorating back and shoulder massage along with Foot Reflexology for a rejuvenating experience. Redefine relaxation and rejuvenation with Foot Reflexology and a Back, Arm and Shoulder massage. As our trained reflexologists manipulate their fingers and knuckles to ease out the knots and blockages and helping you heal from the stress and fatigue of everyday life. Show your loved ones how much you care by gifting them health and wellness. 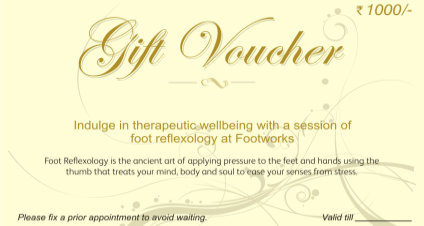 Gift Vouchers from Footworks make an ideal gift for any occasion- A birthday, an anniversary, a success party, a welcome gift or just about anything else. Get more bang for your buck with Footworks Value Packs. 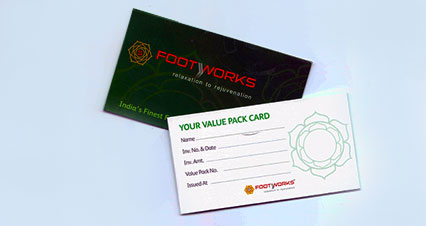 Footworks offers various Value Packs, which allows you to save upto 50% Extra Services. Browse through our various value packs to get more details. For special Corporate Offers, Membership Schemes, Group Bookings & other benefits.